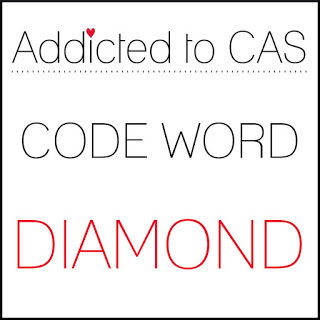 It's time for another challenge at Addicted to CAS and Ceal has chosen her code word. Of course the first thing that came to mind was diamond ring but since I have no stamps or dies that fill the bill I had to go looking for something else. I thought of a couple of things but they would not have made my card clean and simple so I ended up with this. You can't get much more CAS than this. I send out a fair number of prayer cards and most of the ones I make have flowers on them. I wanted something I could send to a man so I stamped the PTI diamonds on left over cuts from the coverplate die in several shades of Altenew gray ink. The sentiment is also from PTI and the inside sentiment says "and in my prayers". Please go check out what the Design Team has done and then make a diamond card of your own. We'd love to see you in the gallery. I love everything about this, Bobby. Great idea to use those die cuts from the coverplate, and the shades of gray are perfect. Fantastic masculine card. and different shades of grey. What a fun design, this is terrific Bobby! sweet and thoughtful card Bobby! No need for rings when you have diamonds this handsome! Love it!